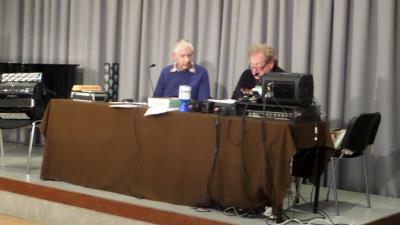 Tony Clayden welcomed us to the meeting, opening the proceedings with Eric Coates' Television March, which was specially composed (apparently, at very short notice) for the re-opening of the BBC Television Service in 1946, and was used daily for several years thereafter. This was to commemorate, in November, the 80th anniversary of the start of regular high-definition television broadcasting in Britain, which was also a world 'first'. He also mentioned, in passing, the recent sad death of Sylvia Peters, (the last of the trio of original post-WW2 BBC television announcers), who will be fondly remembered by many viewers. This was followed by Tonight from West Side Story, sung by Marni Nixon, who also passed away during this year. Ms Nixon became famous for dubbing the singing voice in a number of Hollywood movies, for, inter-alia, Deborah Kerr (The King And I), Audrey Hepburn (My Fair Lady ) and Natalie Wood and Rita Moreno (West Side Story). The accompanying orchestra was that of Robert Farnon, in a recording that was taken from the soundtrack of a BBC 2 TV broadcast, 'The Best of Both Worlds', in 1964. This was one of many Farnon items which had been kindly made available to Tony, at the time of the inception of the LLMMG, by the late and much-missed David Ades. We stayed with Bob Farnon for our next piece, this time providing the accompaniment to Tony Bennett in Bob’s splendid up-tempo arrangement of The End of a Love Affair. Antonio Dominick Benedetto, to give him his full birth-name, has now reached the splendid age of 90, and it is believed that he is still regularly performing ! 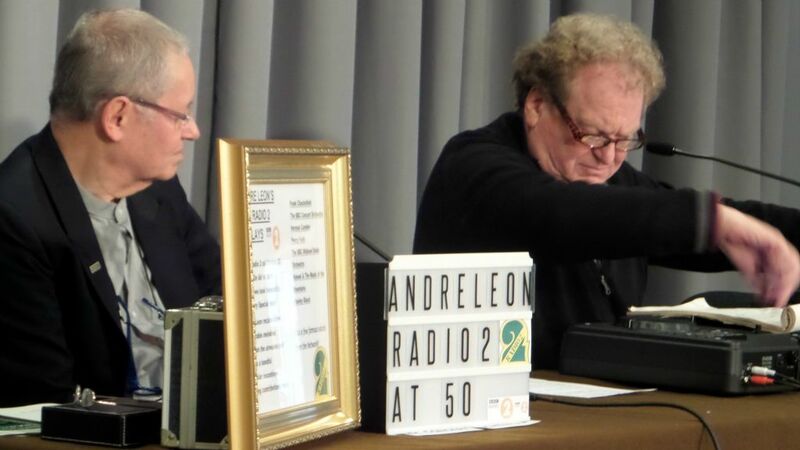 Tony then invited André Leon to the stage give a presentation about next year's 50th anniversary of Radio Two (29th September 1967). He opened with the signature tune of 'Friday Night is Music Night' - Charles Williams' High Adventure,following it with Ron Goodwin's 633 Squadron from the London Festival Orchestra. After this we heard With A Song In My Heart conducted by Norman Candler and Bright Eyes played by Manuel and his Music Of The Mountains - introduced by Pete Murray as part of one of Andre's UK Light Radio broadcasts. 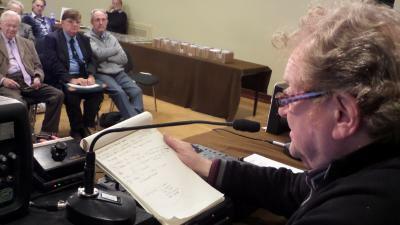 Another introduction followed – this time it was Keith Fordyce presenting 'After Seven' and its theme tune Sunshine played by the Frank Chacksfield Orchestra. André then played a Bob Farnon composition, Little Miss Molly. played by the BBC Midland Radio Orchestra, featuring the flute of Adrian Brett and the piano of Harold Rich. We heard Paul Hollingdale hosting the very first programme on Radio Two – Breakfast Special and introducing its first item - Percy Faith's recording of The Sound of Music. André then talked about the late Sir Terry Wogan - a much-respected contributor to Radio Two, playing an excerpt from one of his introductions, in which he listed many of the shows with which he had been associated. André's presentation concluded with the BBC Concert Orchestra and Singing In The Rain. 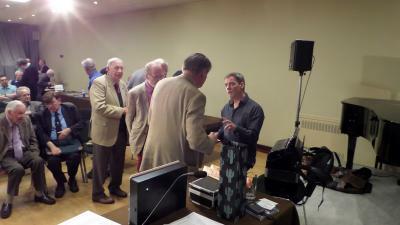 Tony Clayden introduced some new Vocalion CD releases, which were on sale during the afternoon. First-up was Paul Mauriat's recording of Alouette (also known as La Pelegrinacion) and he followed this with Sugarfoot Rag from pianist Floyd Cramer. The next item featured the famous Boston 'Pops' Orchestra under its equally famous conductor Arthur Fiedler – Morton Gould's famous Pavanne and, to round off Part One of our meeting, Tony played us Charles Chaplin's This Is My Songfrom the Werner Muller orchestra. And so to tea ! 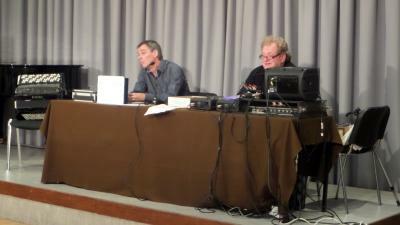 Resuming proceedings, now suitably refreshed, Tony Clayden welcomed our special guest, Neil Varley, an accomplished exponent of the chromatic (buttonkey accordion), and BBC Producer for Radio Three. Indeed, he told us that he had been associated with the BBC Concert Orchestra for some 15 years, mostly on Radio Three, but he had also produced a few editions of 'Friday Night is MusicNight' on Radio Two and was, in fact, responsible for the recent StrictlyPromenade Concert - a really enjoyable show reflecting different aspects of dance and conducted by Light Music Society Chairman, Gavin Sutherland. Neil also referred to the many editions of Brian Kay's Light Programme which he had produced. He had also been involved with that show in his capacity of musician, when the London Salon Ensemble (of which he is a member) were featured. Neil played us a recording of the ensemble playing the Geigen Polka which, not surprisingly featured him prominently on accordion. Neil went on to explain the intricacies of his instrument, demonstrating the use of the couplers and other mechanical facilities which contribute to the instrument's versatility. As a performer (of sorts) on the piano accordion, I thought that this looked much more complicated! 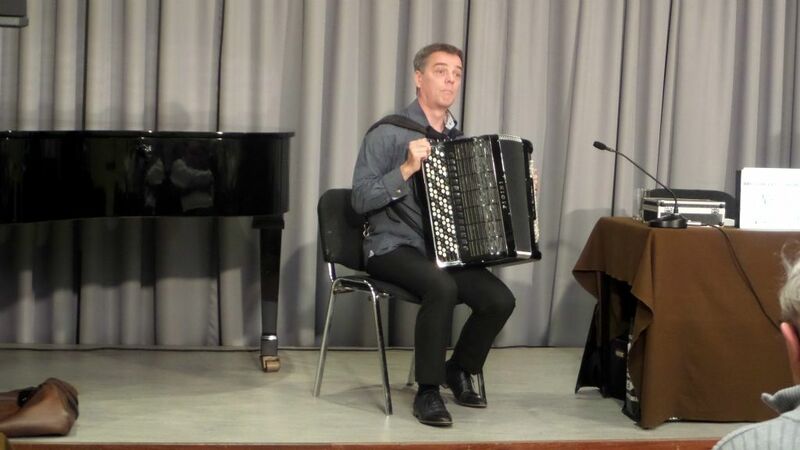 He also mentioned that he was aware of certain derogatory comments often made about the instrument; the one that seems to surface most is the definition of a gentleman being 'someone who can play the accordion but doesn't!' Quite unfair, as it is a wonderful instrument in expert hands. Whilst the piano-accordion was not known in this country until bandleader George Scott-Wood imported one from Italy in the 1920s, becoming its first exponent, and starting a craze for accordions and accordion bands, on a par with the guitar today, the button- key accordion goes back to the 1800s, together with its predecessors, concertinas, bandoneons, melodeons etc. The Russian classical composer Tchaikovsky obviously took the accordion seriously and Neil played us a recording of part of an orchestral suite of his, featuring three accordions. He also played a movement from a suite entitled Winter Sketches, a complex piece which just happened to be his audition piece as an accordionist. He continued with a vintage tape excerpt, Little Miss Bouncerfeaturing Flotsam and Jetsam and other radio voices from the distant past. After Edward White's Puffing Billy - a recording by the Scarborough Spa Orchestra – Britain's only surviving seaside orchestra – Neil played a potpourri of recordings by the BBC Concert Orchestra. 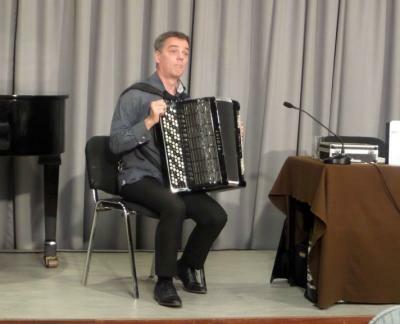 He concluded with the London Salon Orchestra in a private recording of a piece by the group's celeste player, Darryl Griffiths, entitled Parisienne Cafe, in which the accordion featured prominently. This concluded what was universally hailed as a superb, fluent and most entertaining presentation. Indeed, several people spent the ensuing interval talking with Neil, who partly dismantled his instrument to demonstrate its operation! After a short break we returned to our seats for Part Three, to the sound of Firefly by Donald Phillips, played by harmonica virtuoso Sigmund Groven. This gave Tony the opportunity to remind us that Sigmund would be our special guest next May. We then listened to Table Bay as a tribute to its composer Harry Rabinowitz, who died recently, aged 100. Some may have heard his 'Desert Island Discs' broadcast last year. Those of us 'of a certain age' will also recall his regular broadcasting as conductor of the BBC Revue Orchestra in the 1950s. Tony then invited Steven Wills to the stage to make a presentation. Steven, a hospital radio presenter who was making his debut with us, opened with Laurie Johnson's The Beauty Jungle. He continued with one of my favourite Ernest Tomlinson compositions – Mississipi Melody played by the Perry / Gardner Orchestra. (Alan Perry and William Gardner being the pseudonyms of Ernest Tomlinson and Peter Hope respectively). Next came a really 'snazzy' arrangement of Winkler's well-known Neopolitan Serenade, this being followed by Johnny Pearson's Sleepy Shores played by the BBC Midland Radio Orchestra. After this came Steve Race's The Pied Piper and Teapot Gavotte from the Westway Studio Orchestra. Steven concluded his highly entertaining presentation with a medley of BBC radio themes played by Paul Fenoulhet and the London Concert Orchestra with The Stargazers. The medley included themes from 'Take it from Here', 'Educating Archie', 'Hancock's Half hour', 'Ray's a laugh' and Horse Feathers from 'Meet the Huggets'. It then fell to me to bring the afternoon to a conclusion with my usual 'Radio Recollections'. Unlike the majority of pieces heard during the afternoon, my choice of items came from my extensive collection of vintage off-air broadcasts, as opposed to records. I commenced with a composition by conductor Harold Geller, entitled Street of Linden Trees played by Bill Savill and his orchestra. This ensemble did a phenomenal amount of broadcasting from the 1940's until the late sixties. It specialised in ballroom dance music, but undertook society engagements – as opposed to Palais work. Next, I played a piece written by a distinguished BBC man, Brian Willey – whom we have been pleased to welcome to our shows ever since he was our special guest a couple of years ago. This piece was called Summer Love in Napoli and was played by Carlos Romanos and his orchestra. Incidentally, Carlos, whose real name was Wilf Todd, wrote some lyrics to this piece, but we just heard the instrumental version! We continued with one of my favourite pieces of light music, Lady Beautifulplayed by Reg Pursglove and the Albany Strings. This was composed by cinema organist, turned BBC executive, Fredric Bayco. As so often happens on these occasions, time was running out and it was only possible to play one of the remaining three items which I had lined up. So I chose the delightful Carriage and Pair by Benjamin Frankel. This started out as incidental music for the 1950 film 'So Long at the Fair'. It was played by Sidney Bowman and his orchestra and brought the meeting to a conclusion. It only remained for Tony to bid us farewell and invite us to assemble once again on May 7th next year, for another afternoon of quality Light Music. The next LLMMG meeting will take place at the Lancaster Hall Hotel on Sunday May 7th 2017 – All are welcome, please tell your friends !